One of the reasons I love food blogs has been discovering treasured recipes others consider to the best they have made, served and eaten. 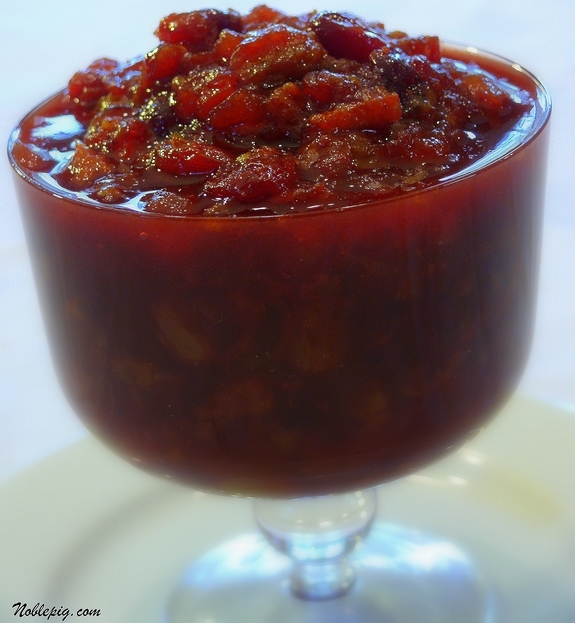 A fellow blogger, Cathy, over at Wives & Knives, just posted this chutney as one the most treasured recipes from her mother’s files. You know those are the best ones. When I looked at the list of ingredients I just knew it would be good. However, I did not know it would exceed all my expectations. It is absolutely fantastic and out of this world. There are also no cooking skills required to make this. You just combine ingredients and simmer until done. Nothing could be easier. Everything about this chutney screams Thanksgiving and the holidays. I’m pretty sure I can throw away all my other cranberry sauce or chutney recipes; this is now my hands down favorite. Cathy emphasizes to include all of the ingredients such as the curry powder. Even if you don’t like curry….it does not taste typical…it’s a background flavor, enhancing other flavors present. Also, do not leave out the candied ginger because you think you can’t find any. Candied (crystallized) ginger is everywhere now. I remember years ago only being able to get it at Williams-Sonoma but now I see it in the baking aisle and in the bulk food section of most grocery stores. Don’t leave it out, it adds an incredible taste. I served this with a roasted turkey breast and mashed potatoes and slathered it on turkey sandwiches the next day…incredible. Funny thing is, I have never canned anything. I’ve always wanted too but have just never gotten around to it. This recipe has gotten me off my rear to finally do it. I want lots of jars in the pantry to carry me throughout the year. I have to get on it before all the fresh cranberries disappear from the markets. Cathy also suggested pouring this chutney over cream cheese for an appetizer, which would be delicious as well. Thanks Cathy for sharing this amazingly wonderful recipe. Combine all ingredients in a large, heavy pot. Bring to a boil, reduce heat to low and simmer for 40 minutes, stirring occasionally. This keeps indefinitely in the fridge and will easily form a seal if poured, very hot, into small, decorative jelly jars…which I am going to do. I think I will be making this very soon. It does have all the ingredients I love and that scream “autumn”. Thanksgiving”…. I just read a blog where they made a cranberry chutney, put it on brie and wrapped it en encroute. Think this would work too? Sounds yummy to me! i’d like to make this for thanksgiving. should it be served hot or cold? This does sound amazing and perfect for the looming holidays. You have such a good eye for finding what works well. I am making this next week. It sounds incredible. Saw it on Wives with Knives and loved it, with both of your raves, I know its a winner. I always make the Barefoot Contessa’s recipe, but this one looks really good. I’ll have to give it a try some time. That chutney sounds incredible! And your photos of it are stunning, as always. Good luck with the canning. It’s very easy and oh so satisfying. this may be the recipe that causes curry powder to make its way into my spice collection permanently. what an awesome list of ingredients, and what a beautiful product! well of course it’s fantastic with crystallized ginger… but especially the curry powder. I find a pinch of curry powder in so many dishes adds that je ne sais quoi, even though you can’t necessarily taste it. The ingredients list sounds fantastic…wow. The candied ginger and curry are very nice additions. I love that I don’t have to come up with creative food ideas on my own. I come here and !Voila! Cathy has it all figured out for me . . . can hardly wait to try this! Ooh, that does sound really good. The thing that stinks is I’m not sure anyone else in the family will eat it and we’re just having T-day with just us this year. I’m definitely marking this one for making sometime though! I’m so happy that you like this recipe, Cathy. Sharing with friends is what it’s all about. 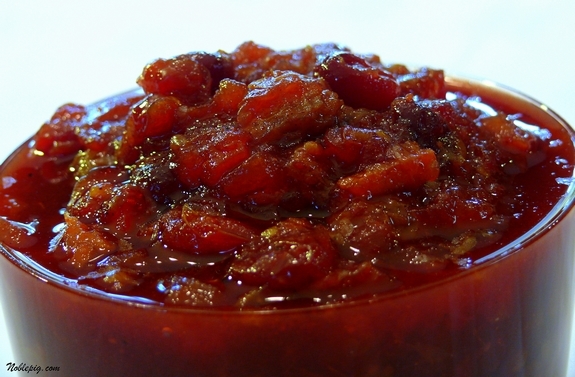 I like to serve this sauce cold and chilling allows the pectin in the cranberries to thicken it a bit. I buy bags of fresh cranberries and stick them in the freezer so I can make fresh sauce all year long. Try it on barbecued chicken…over the top. This is a wow list of ingredients. There are so many of these recipes but I trust food bloggers the most as far as what is good. This will be on my T-day table. Looks like a good change of pace for cranberry sauce,l but I would probably be shot for messing with tradition. Maybe on a non-traditional day? Being shot would make Thanksgiving sorta unpleasant. This looks amazing – it’ll be on my table too – oh and for Christmas with tourtiere (French Canadian pork pie). Oh my! Mine is boiling on the stove. I can’t wait. Mine is simmering on the stove, too! It smells fantastic. This is replacing that cranberry Jello mold I grew up on that nobody ever liked! THANK YOU! I all ready have a mulled cranberry recipe that I use over and over, but this sound so good, I’m going to have to give it a try! I thought this looked wonderful over at Cathy’s blog! Very nice adaptation of her family recipe. This is perfect for Thanksgiving. I can’t wait to try it! Yum indeed! This year I hope to try some fresh cranberry sauces. what a delicious sounding chutney think I will have to give it a go. I had all of the ingredients, so I made it today. It is as wonderful as you said. I was wondering. Is there a way to print your recipes? Your photos are terrific Kathy! 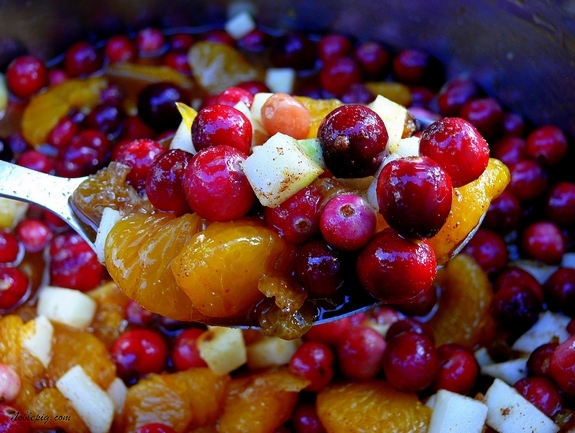 I have been mulling over something different than the standard cranberry sauce- this would be perfect. Copying now. Makes a great hostess gift too! Ooh I love a good chutney and this one looks perfect to go with my samosas! I’m not a fan of traditional cranberry sauce, but I’d definitely try this version! Bingo! I love trying new cranberry recipes each year and this sounds amazing. that 2nd picture got me! chutney’s, most anyway, are great to serve with a lot of food. indeed always fun finding treasured recipes from other peoples’ blogs. Just made this today with apricot preserves (instead of marmalade) minus the mandarins and less 1/4 cup sugar….soooooooooo delish…the curry and ginger really are that special something! Absolutely amazing flavor! And it made the house smell so “holiday”. I have it simmering on the stove and the jars are in hot water. Smells heavenly! Thank you very much for this recipe. I am not a big of a cook, but I tried it today, went to store to buy some ingredients, I am glad I did, it is SO_O_O_O_U delicious! Love it! Love it! This was absolutely fantastic. I jarred it and added it to my Christmas presents to give something a little unique. Lots of the older people in my family have health problems, so I used mandarin oranges canned in their own juices instead of syrup, and I sweetened it with 1 1/4 cups blue agave syrup rather than white sugar. I served it as cranberry dressing at Christmas and it was a huge hit! Thanks! I had got a dream to start my own company, but I didn’t have got enough of cash to do it. Thank heaven my friend recommended to take the loan. So I received the financial loan and realized my dream. I have made this every year since you have posted it. It is excellent. During the holidays I serve it over cream cheese with crackers – if I have any left after gift giving and using it myself. – great on sandwiches. Made this last year and will be making it again this year. Delicious! I serve it over warm Brie topped with toasted pecans. I tried this recipe today and although I had my doubts, it was delicious. A keeper for sure.